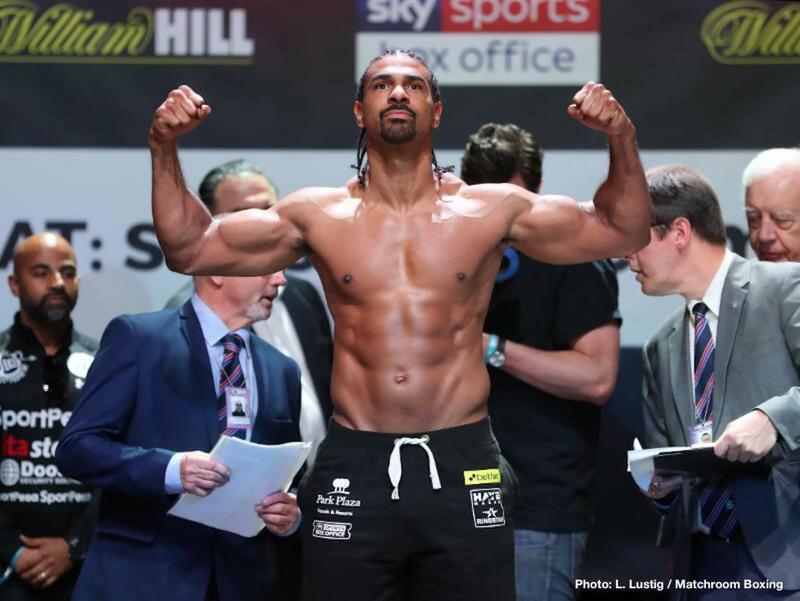 David Haye: Today (Tuesday, June 12, 2018) I announce my retirement from professional boxing. They say you can’t play boxing. Yet, as I write this retirement statement, and reflect on my time in the sport, I can’t find a better way to describe the ride. Thanks to boxing, I have been able to live my unencumbered childhood dream; a dream my dad, Deron, facilitated the moment he took me to Fitzroy Lodge amateur boxing club as a nervous 10-year-old. From the very start, my parents encouraged and supported me, and convinced me I could achieve anything I set out to do, so long as I gave my very best. This proved the catalyst to me believing I could always win in life, no matter the circumstances. It also led to me giving my heart and soul to boxing for 27 years. On reflection, my 16-year, 32-fight professional career was one of two halves. In the first eight years, everything ran smoothly. I had 25 fights and became the first ever British boxer to unify the cruiserweight division (WBA, WBC and WBO World Championships). I then achieved my childhood dream when I beat WBA Heavyweight Champion of the World Nikolay Valuev, the seven-foot-two, 150-kilogram ‘Beast from the East’, in a real life ‘David and Goliath’ match. Lifting that World Heavyweight Championship meant I’d fulfilled a promise I’d made to my mum, Jane, at the age of three. It also meant I was the second boxer in history – after Evander Holyfield – to win world titles at cruiserweight and heavyweight. That was an incredibly proud moment for me and my family and friends. Yet it was in the second half of my career where I really discovered what it meant to fight and be a fighter. If I had it my way, I would have fought as many as 16 times in the second half, the last eight years. But, unfortunately, during this time my faulty body only allowed me to step through the ropes on seven occasions – four wins, three losses – and often it was a fight just getting to the ring in one piece. In the past five years I have snapped (fully ruptured) both biceps, my rotator cuff and my Achilles tendon. All four injuries were potentially career-ending and each of them required operations with months of intense rehabilitation. I went into surgery 191 centimetres tall and came out 193 – not a bad silver lining! – but literally had to learn to walk again. This made my comeback fight against Mark de Mori (in January 2016) all the more meaningful, as it was only 10 months after such intrusive spinal surgery (as well as being my first fight in four-and-a-half years). Ultimately, this was one battle I had to fight in private, and it’s only because the process was recorded for a documentary that people will one day be able to grasp the severity of the situation. In this physically challenging period, I also changed head boxing coach twice, moved gyms, launched a new promotional company. This meant, despite not getting in the ring as often as I’d have liked, I still had to keep fighting daily battles outside the ring. But my desire and determination to be the best heavyweight on the planet was all the motivation I needed to embrace these hurdles. I had to find fun and excitement amid the drama. It was the only way to keep that dream alive. Thankfully, the challenges of the last eight years forced me to develop new facets of my character. They made me tap into an optimistic and positive mindset, one I’d never really had to engage before. It’s easy to be upbeat and positive when everything in your life is going to plan. But experiencing true disappointment, sadness and uncertainty can be the key to unearthing one’s true character. For instance, controlling emotion and desire, showing compassion, and dealing with loss were things I had no real handle on until recently. I was a 22-year-old kid when I turned professional; I finish my boxing career as a 37-year-old man. I also finish my career on a defeat, however. Ahead of my final two fights with Tony Bellew, we publicly showed each other little respect. But this was just two veterans giving the crowd what they wanted: a grudge match. Despite the pre-fight hype, I can assure you I have a huge amount of respect and admiration for Tony. Whenever I traded punches with him, and whenever I was in his presence, I felt the inner warrior. I saw a man who would take the battle as far as necessary to get victory; a man who, like myself, would rather die than give up or quit; a man I’d want on my side of the battlefield if going to war. As for what happened on May 5, 2018, I did not walk to the ring injured, nor injure myself during the fight. On the face of it, I was in tip-top shape. I’d adapted and modified training sessions around my 37-year-old body with great success. When stood in front of the locker room mirror before the fight, my body looked as it did 10 years ago; my mind primed and ready for action. I walked to the ring with nothing but confidence. In the end, what 20,000 fans inside London’s O2 Arena witnessed was me giving 100% effort but performing way below world level. For my fans, it must have been like going to support their favourite thoroughbred racehorse at the Grand National, only to see their stallion stumble out the gates like a sedated mule at the Donkey Derby. I saw punches coming but wasn’t quick enough to avoid them. I created openings but lacked the speed and agility to capitalise on them. Quick, bread and butter counterattacks, the sort I’ve effortlessly thrown since my teenage years, are no longer in my armoury. And when I take shots, they now shake me to my boots. The things I used to be able to do in the ring – instinctively – now exist only in my mind and in video clips of my old fights. That said, credit where it’s due: even 10 years ago – in my ‘Haye Day’ – I’d have had a hard night fighting the 2018 version of Tony Bellew. He boxed brilliantly. I’ve taken my fair share of beatings over the years – some easier to swallow than others – but this last one had a certain heavenly comfort to it. In a strange sort of way, I’m proud to have gone out on my feet, on my own kamikaze terms. Of course, my ego would have loved to have retired on a win, or as a champion. But, deep down, I know my effort on May 5, 2018 was the very best I had left to give. I also know that underwhelming effort revealed the truth about my current abilities in a world-class boxing arena. The boxing gods have spoken. They will no longer protect me with the freakish speed and power I used to possess. And without these God-given gifts, I completely lose my edge. Boxing history has a way of repeating itself, and the list of boxers who voluntarily retired during their peak is a short one. Most bite off more than they can chew in their twilight years, believing they can rustle up one last great performance, and this pursuit becomes greater than the fear of losing. In short, the personality traits that make someone potentially great – never giving up, fighting until the bitter end – will often lead to their downfall. I’m proud of the battles I’ve been through. I’m proud, too, that I exit the battlefield happy and healthy, with my family financially secure. Most importantly, I can reflect on it all with crystal clarity. I will always remember standing beside my dad in the ring after my last fight, and him saying how proud he is of me. Having given everything to boxing for nearly three decades, this meant so much. In that time, I put everything associated with my sport first and everything else, and everyone else, second. Consequently, I achieved 80% of my life goals. But it came at a cost. Extraordinary achievements often go hand-in-hand with extraordinary sacrifice. In my case, the most significant collateral damage of my single-minded approach to fulfilling my goals was the impact this mindset had on relationships with those closest to me; family, friends, colleagues, people who made sacrifices day in, day out, not to realise their own dreams but to support me in realising mine. I look forward to reimbursing them with my time and love now that my all-consuming boxing career has ended. Upon hearing this, I decided to metaphorically ‘dance’ my way through my last training camp. And that I did. I relished every moment, even the lung-busting, lactic-filled sessions. I enjoyed the ride right to the very end, which is why I can now accept retirement with my head held high and a smile on my face. If I could go back in time and give advice to my 21-year-old self, or anyone setting off on their own adventure, I would say this: live in the moment. Don’t only appreciate the good times once they become a memory. The present is the only thing that truly exists, so give it the attention it deserves. Do not forsake daily happiness because you believe there will be an abundance of it once you reach the mountain top. There’s no chest of happiness waiting at the top of the mountain. Instead, there are only memories of how you got there. So, make these memories worthwhile. Thank you to all my loyal family, and all of ‘Team Haye’, my extended family, who helped me through these tough years. You know who you are, and you all contributed to my story, no matter how significant your part. I love you all. To my fans, thank you from the bottom of my heart, for dancing through the tough times with me, and applauding my efforts regardless of the result. Your kind support always meant the world to me, and I won’t forget the many great nights we shared. Thank you, also, to everyone who has supported not only me and my career but the sport of boxing as a whole. My sport. The beautiful noble art. Without you, the fans, there is no boxing. TV networks would not televise shows, promoters would not book venues and the media would not report on boxing, if it wasn’t for your interest. So, please continue to support boxing. Whether watching it on TV, buying tickets and boxing magazines, or even just having heated debates with buddies about fights, it all keeps the sport thriving. Never forget that boxing is the ultimate working-class sport, one that gives regular people from humble beginnings – like me, like many of you reading this – the opportunity to work hard and fight their way to a better life. And just as boxing gave me the chance to make my dreams a reality, I now hope my children do the same in whatever path they choose. They know from their father’s story that anything is possible with hard work, dedication and extraordinary sacrifice. Since October 1990, I have been a boxer. That’s nearly 10,000 days of eating and sleeping boxing, and now I’m ready to close this chapter in my life. This is not the end of my story. It’s simply the start of something new.